When it comes to cocktails, the Martini is king. With summer here we offer fun fruit forward variations perfect for the hot sunny days ahead. You’ll need a blender for this one, but it’s totally worth it for a frozen, watermelon-based cocktail on a hot summer day. And the cooling properties of cucumber will keep you refreshed all day long. Prepare the Cucumber Simple Syrup: Combine sugar and water in a small saucepan. Bring to a boil for 10 seconds then remove from the heat and add cucumber slices. Allow syrup to come to room temperature, then strain into a jar and place into the refrigerator to chill. Syrup will be good for up to a month. 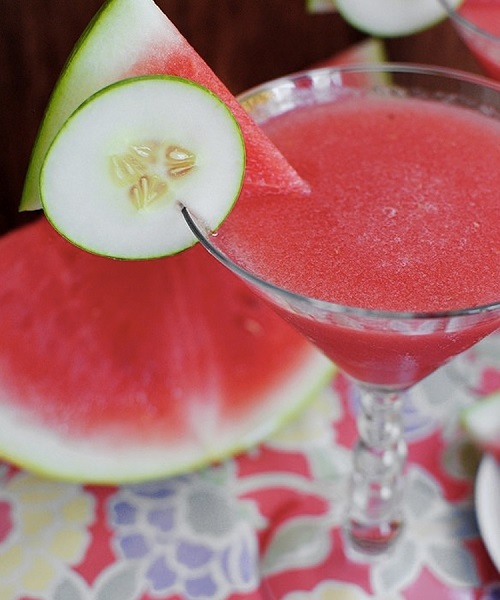 Place watermelon into a blender and blend until smooth. Measure out 1 cup juice then pour into a martini shaker with vodka, cucumber simple syrup, and lime juice, then fill the shaker 3/4 of the way full of ice and shake. Strain into two martini glasses and serve. A Martini, a Margarita and a pimento-stuffed olive come together to create this delicious cocktail. Warning — this one packs a serious punch. We’re not sure what’s hotter, the afternoon sun or this spicy sipper. 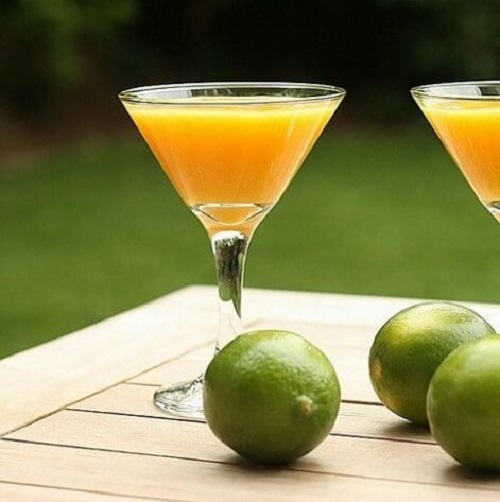 Measure tequila, soda, orange liqueur, lime juice, orange juice, and olive juice into a shaker filled with ice. Shake and strain into salt-rimmed martini glass. Garnish with a skewer of olives. Spread a thin layer of coarse salt onto a plate. Use a slice of lime to wet the edge of the martini glass, then dip in the salt, turning until well-coated. 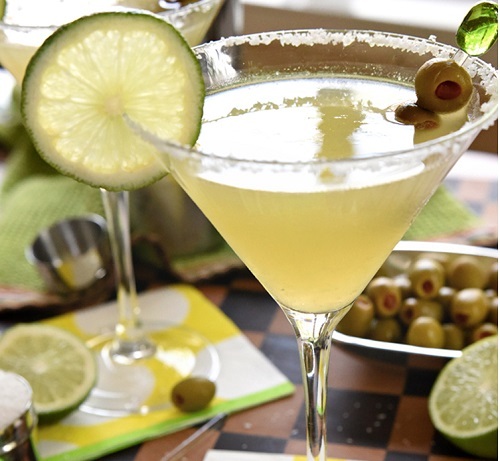 To add some spice, garnish with gourmet green olives that have been stuffed with jalapenos. Less traditional than the gin + vermouth martini, this flavor-tini has one of the most tropical fruits infused in it to give it a more island feel. The Triple Sec helps too. Forgive its sweetness. Place crushed ice in a martini shaker. Add vodka, liqueur, and juices; shake to combine. Strain rum mixture into a martini glass; garnish with mango slices, if desired. Serve immediately.